I hope you find this report informative and helpful in your decision-making with respect to selling your property. This article is meant to assist with general selling concepts. If you feel you need a more customized plan, its always best to contact a real estate professional to help guide you through making the difficult decision of how to go about selling your loved one’s property. Possibly one of the most daunting tasks you’ll have as an adult is to sell the home of a relative after they’ve passed away. Known as a ‘probate property’ or ‘estate property’, it will be up to you, as the executor of your loved one’s estate, to handle all of the myriad of tasks necessary to prepare, market and sell the house (or other type of property) after your relative is gone. It’s no easy task, as you might imagine. Depending on the circumstances leading up to their death, their home may be in pristine, ready-to-sell condition, or it might be an absolute mess, filled with junk, and falling apart at the seams. If it’s the former, getting it sold for top dollar shouldn’t be too large a task. If it’s the latter, your headaches are probably going to be a lot bigger and more stressful. Keep in mind this Free Report will give you advice about selling the home or property for top dollar. The fact is, if you want to sell it fast (and you’re not worried about how much money you make), you can always sell it for cash and be done much more quickly. But, again, if you want top dollar, below are the basic steps you’ll need to take in order to do that, and have the best chance of success. In nearly all cases, the home will need to be empty, which means getting rid of possibly years’ worth of stuff like furniture, clothing and household goods. To do this, you’ll either need an estate sales company or auctioneer, a friend with a truck, or your local Goodwill. If the furniture and household goods are high quality and valuable, an estate sales planner is best, so that you can possibly get fair market value for anything of value like artwork, antiques or valuable jewelry. If their stuff isn’t so good (and even if it is) you should probably consider giving it to Goodwill, or have a garage sale. Frankly, these days, putting it all out on the curb also works as, in most cases, it will all be gone in a matter of days (or hours). Next, is to make sure the home is clean. Your buyer is going to want to “see” the property, which is impossible to do with furniture and junk standing in the way of their ability to do their due diligence. A clean and clear property gives the appearance that someone cared and made an effort to try to maintain the property. If there are any repairs that need to be made, arrange to have them taken care of by the appropriate professionals. This is actually more important than emptying the house if you want to sell it for top dollar, because a damaged home that’s in disrepair, won’t sell for nearly as much as a home where everything is in good condition and working properly. Once the home is cleaned out and, if necessary, repaired, your next step should be to have it appraised by a reputable home appraising company. Knowing what the property is worth is vitally important to selling it for the most money, and your goal should be to sell for at least 90% of the appraisal amount less repairs (if not more). Keep in mind that taking care of all of these tasks will likely cost you a fair amount of money, so be prepared to pay those costs up front. If you do things correctly you will, of course, recoup that money once the home / property is sold. With this option, you’ll get a cash offer for the property. No cleaning or selling the household goods is necessary, and you won’t need to make any repairs either, so you won’t have any up-front costs to pay. With a ‘quick-sale’ you also won’t have any closing costs, and the closing will usually be much faster. In fact, a quick sale or “as-is sale” is the easiest, fastest way to sell a probate property, with the least amount of stress. In most cases, it’s completely hassle-free, but be prepared to only get 60% to 80% of the home or property’s true market value. Selling Strategy #1 is for you if you want to get rid of the property as quickly as possible and get money as fast as possible. If you select this strategy, you should have between $10,000 and $20,000 available for cleaning, basic repairs, and light staging. Be prepared to pay 7% of the sales price in closing costs. The goal is to make the house look good for the public when they come to see the property. You should expect that the buyer will want to have the property inspected. The buyer will expect the seller to pay for any repairs the inspector finds or provide a generous credit so the buyer can make these repairs themselves. 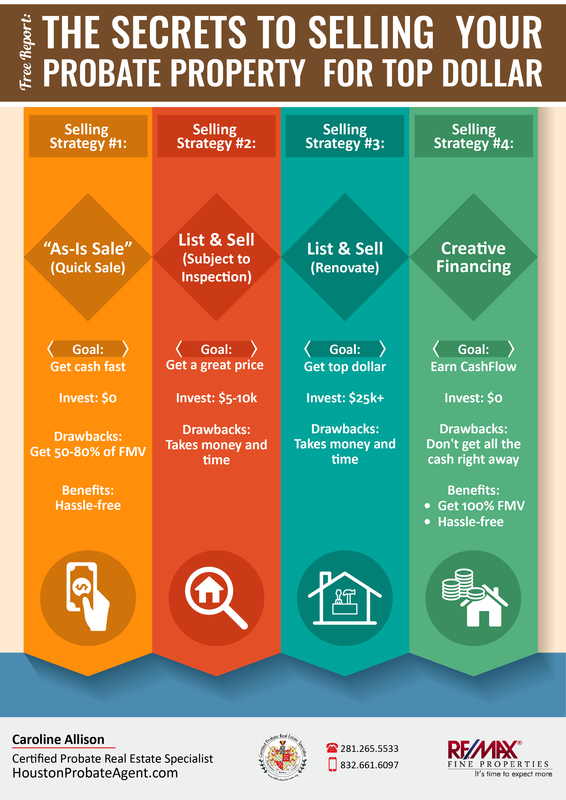 So Selling Strategy #2 is for you if you have some time available to wait while the home is prepared for sale, a modicum of money to pay for repairs and other costs, and want to get a bit more money for the house and/or property. Selling Strategy #3: List the Property; Make Extensive Renovations & Updates – Sell the property for 95% to 100% of Market Value, or even more, with Multiple Offers. This is the Selling Strategy we’ve already been talking about the entire time in this Report, and will net you the top dollar you’ve been looking for. You’ll need approximately $25,000 or more for repairs and renovations, including professional staging. It’s best that the property is cleaned out. And as we mentioned, and you’ll pay 7% closing costs since you’ll need a real estate agent’s help. Frankly, this is the least popular option for most people, as it requires the most work, the most up-front costs, takes longer (usually) than the other options, and can be the most stressful. If done right however, the property can often sell very fast and, as we’ve talked about at length, you’ll get the most amount of money when all is said and done. With this Selling Strategy, its also possible to get multiple offers and get over list price. Selling Strategy #3 is for you if you have time to wait, plenty of money to pay for repairs, professional staging and other costs, and want to get top dollar for the property. Creative financing is a catch-all term that means you will sell the probate property using a non-conventional method. One of those is to offer seller-financing, which would attract buyers who don’t qualify for traditional loans. With this scenario, you become the ‘bank’, and the buyer pays you a certain monthly amount over a certain amount of years (typically much shorter than a traditional mortgage loan). You could also offer the property as ‘rent-to-own’, allowing a buyer to rent the property while also paying a certain percentage of the purchase price. These creative financing options allow you to create a monthly income stream for yourself, but it also means you’ll have to wait quite a bit longer to get the full amount of the property’s sale price. With this option, getting advice from a CPRES professional (see below) is a very good idea, so you can set up all the parameters correctly and avoid stressful problems down the road. Selling Strategy #4 is the way to go if you don’t need the money from the sale of the house but, instead, would rather create a monthly income-stream for yourself over a longer period of time. 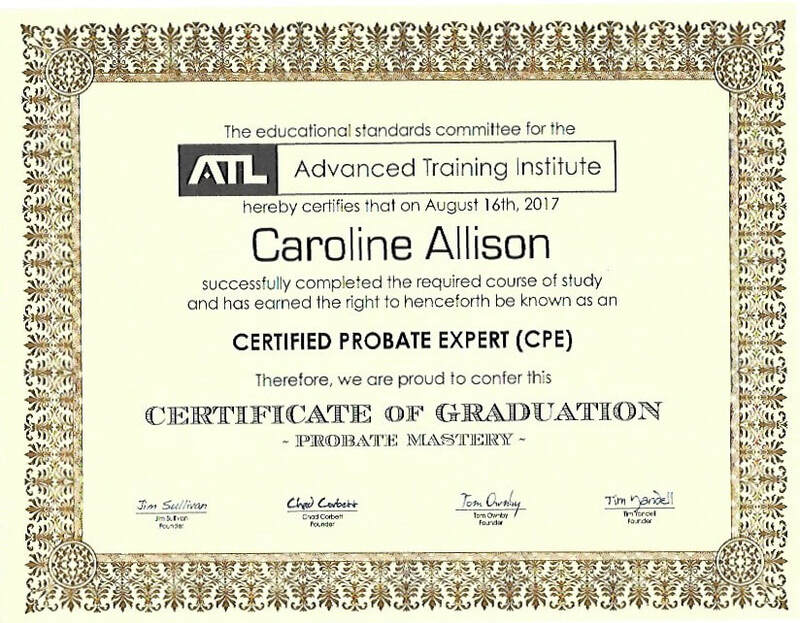 Hiring a CPRES, a Certified Probate Real Estate Specialist. Now, one caveat; you could do almost all of the aforementioned tasks yourself and still be successful. Yes, you’ll need a real estate agent to take care of the actual sale (if that’s one of the options you choose), but if you’ve prepared everything, emptied the house, had everything repaired and made it look attractive and livable, it’s definitely possible to do it alone. 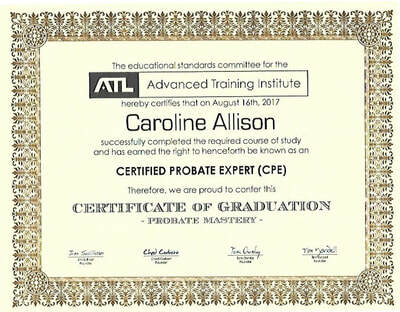 But, if you’re like most, with a life that’s already busy and your own long list of tasks, chores and work to do every day, your best bet might be to contact a real estate agent whose a Certified Probate Real Estate Specialist or CPRES. 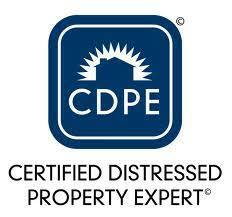 Hiring a real estate agent who’s CPRES certified will make all of the aforementioned tasks much easier. They have the experience, the network, and the training to handle everything. In most cases, they will also have a list of contacts with all of the specialists necessary to empty out the house, clean it and repair it. In short, a CPRES real estate agent can help you sell you probate property for the best price possible, with the least amount of extra stress during this already stressful time. Best of luck and, if you have questions or need advice, please feel free to reach out to us by phone at (832) 661-6097 or by email at ciakwm@gmail.com.